This kayaking trip is based on the story of Tamar Tyner. So before you read my story, you have to read about Tamar. Here are a few links about her. Please read one of these first. So, Mary and Tamar were taken captive in about 1778 or 1779 when Mary (born in 1765) was about 13 or 14 and Tamar (born in 1767) was 11 or 12. Mary married John Mamack soon after he found them in 1783 which means Tamar was about 16 years old when she escaped. The Coweta indian towns referred to in the accounts are what is now Columbus, GA. Columbus was established in 1828 some 45 years after Tamars escape. 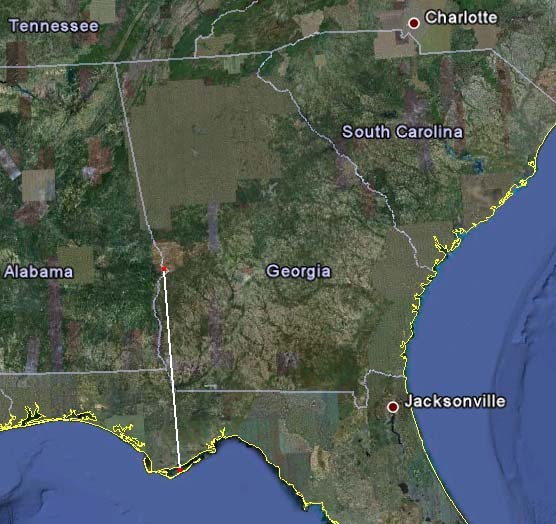 The planned trip is drawn below using Google maps. The straight line is 180 miles long however, with all the twists and turns the river makes, the actual distance travelled is about 255 miles.